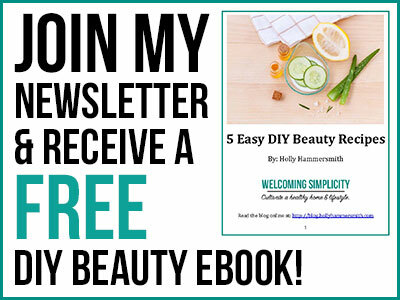 About five years ago I began a conscious effort to reduce the use of chemicals and unnatural products in our home and in my personal daily beauty routine. The efforts were spurred in part by the adoption of our rescue dog Lulu and realizing that using chemical cleaners in the home wasn’t healthy for her – or us. 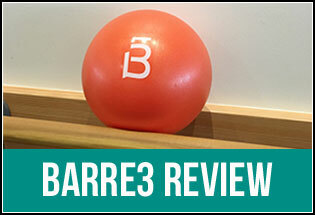 The beauty product recipes not only gave me peace of mind regarding my personal health – they also helped to save money. One of those recipes is my natural makeup remover, which I’m sharing today. 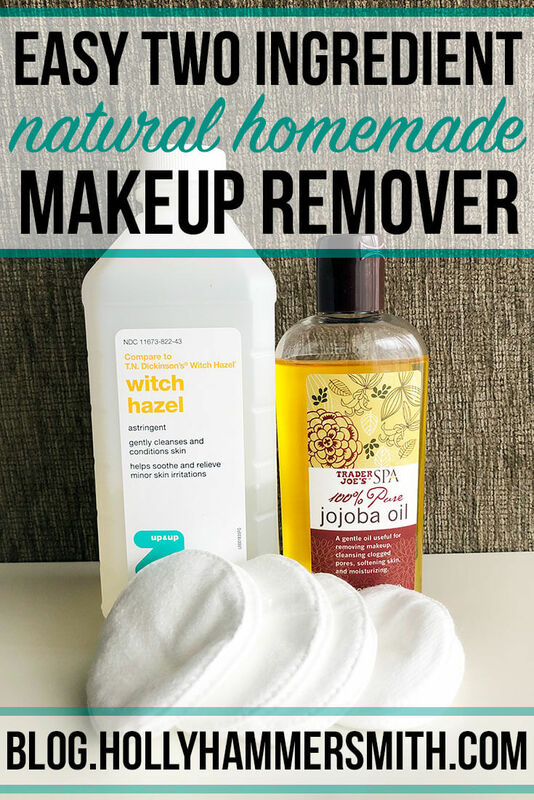 This natural makeup remover recipe is quick and easy to make, holds a good shelf life without any added chemicals, is affordable to make and best of all only requires two simple ingredients. 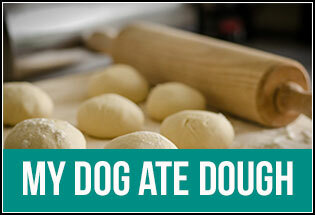 I’ve been making and using this same recipe for about five years now with success. It’s gentle on my skin year-round, does not leave a greasy residue or dry my skin and of course – it actually works! What Will I Need for Natural Makeup Remover? Once you have purchased these ingredients you are ready to make the natural makeup remover. These ingredients can be purchased at most drugstores. The jojoba oil may be harder to find. 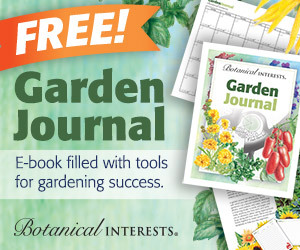 I have purchased it at Trader Joe’s and it’s readily available on Amazon. Before I explain the process to make the makeup remover, I want to briefly explain the purpose and benefits of each ingredient. Jojoba Oil is a gentle oil perfect for not only removing makeup but also for cleansing the skin and cleansing clogged pores. 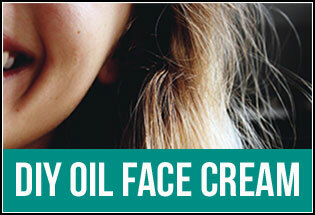 The oil can also soften and moisturize the skin. I like that jojoba oil is not irritating to my skin and rather soothes it. Make sure you get 100% pure jojoba oil that is not mixed with any other carrier or scent. Another reason I like jojoba oil is because it leaves my skin feeling moisturized, not greasy. It’s very a very light oil, not heavy at all. I have also used Jojoba Oil for a Homemade Face Moisturizer. Please Note: Some skin types could be sensitive to jojoba oil, or any natural oil. You might want to try a test of the oil on your face before making a full batch of this makeup remover recipe. Personally I have found this oil to be very gentle compared to other oils. Witch hazel is an astringent, intended to gently clean and condition the skin. 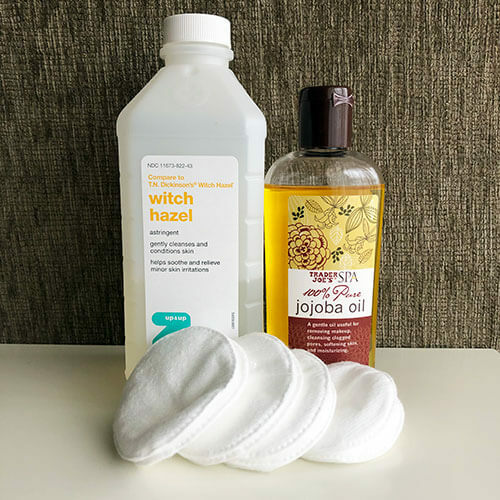 In addition to using it in this makeup remover recipe, I also occasionally use witch hazel as a skin toner for my face. Witch hazel is also used to relieve and sooth minor skin irritations including insect bites, minor scrapes and minor cuts. Please Note: Witch hazel does have a caution on the table to avoid contact with the eyes. If you opt to try this remover for eye makeup please use caution and keep the eye closed while wiping the skin. What Kind of Pads Should I Use? 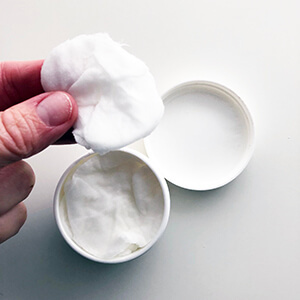 The makeup pads I use are premium cotton rounds made of 100% cotton. They are dual sided and hypoallergenic. They are basically the “deluxe” pads. You can really buy any version or a less deluxe version, these are simply the ones I use. I purchased some makeup remover pads at Target, or you can also find them on Amazon. The pads are durable, soft and lint-free so they do not leave any fuzz on your face. The make up pads have an embossed cleansing side and then a smooth side. They are gentle and made for all skin types and I have found them to be the best makeup remover wipes. I use a few table spoons of witch hazel and then about eight to ten drops of the jojoba oil to a bowl. I mix jojoba oil and witch hazel in the bowl. Then I add a handful of those round makeup removal pads.I added about eight pads to the solution and let them soak it up. Let the pads soak it up and then I store them in an old container that housed Almay makeup removal pads. Then I gently squeeze them to remove a little bit of the liquid so they were not dripping. I placed them in the container and then added a few more pads to the bowl and repeated the process until no liquid was left in the bowl. How Do I Use the Natural Makeup Remover? I use the DIY makeup remover to remove my foundation. I wear mineral makeup by the BareMinerals line. I use one pad each time I remove my makeup. I will use one side and gently wipe my entire face. Then I turn the pad over and wipe my face again. After that I will wash my face either with just warm water or with my usual face wash. I have been using Cerave face wash for several years now at the recommendation of my dermatologist and it works well for me. I do not wear heavy eye makeup so I’m not sure how the DIY makeup remover would work on that. The container I have holds about 12 of these pads. I do not wear makeup frequently so each batch lasts a decent amount of time for me. 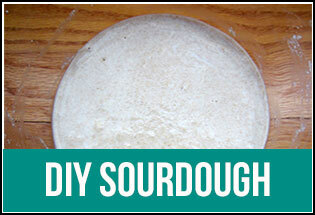 If you would like to make more I suggest using a larger container. Make sure the container is air tight so the pads do not dry up. The container I use is an old Almay Makeup Remover Pad container. You can use any container. This one is the perfect size for the round pads and I only need a few so being it’s small it travels well too! 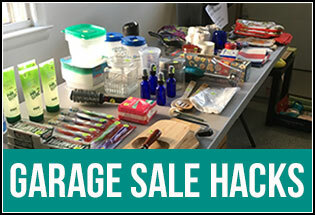 You can find containers online or use an air tight (washed) container you may already have at home. Jojoba oil works great to remove makeup and the witch hazel is a nice balance and helps tone the skin. Making the pads takes less than five minutes and it’s easy to whip up a new batch whenever they run out. 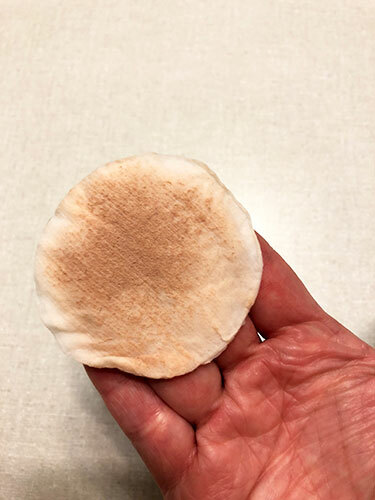 I’ve been using these homemade pads for at least five years now and it’s been the best makeup remover I have ever used. Not only do they work well and remove makeup while soothing the skin the whole concoction has saved me countless trips to the store and saved me money! 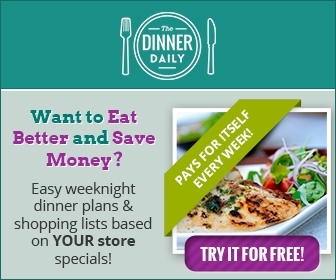 This is super helpful, especially with the holidays coming up! I wear a lot more makeup in December thanks to all the holiday parties! Thanks for the advice! So this may be a dumb question, but why do you use makeup remover and then wash your face? Wouldn’t washing your face remove it? Or is your cleanser to gentle to actually get the make up off? No, that’s a good question. The facial cleanser I use is supposed to help with cleaning the skin of excess natural oils and just grime from the elements. It’s not advertised as a makeup remover. I think some women use cleaners that are makeup removers so they may not want or need to use a recipe for the makeup remover pads. I love DIY – especially something you put on your face, knowing all the ingredients in it. Thanks for sharing! Thank you so much! I’m definitely going to try this.